HELSINKI (AP) — The writer and political activist who was forcibly removed from a room where U.S. President Donald Trump and Russian President Vladimir Putin were about to give a joint news conference said Tuesday he wasn't trying to protest. 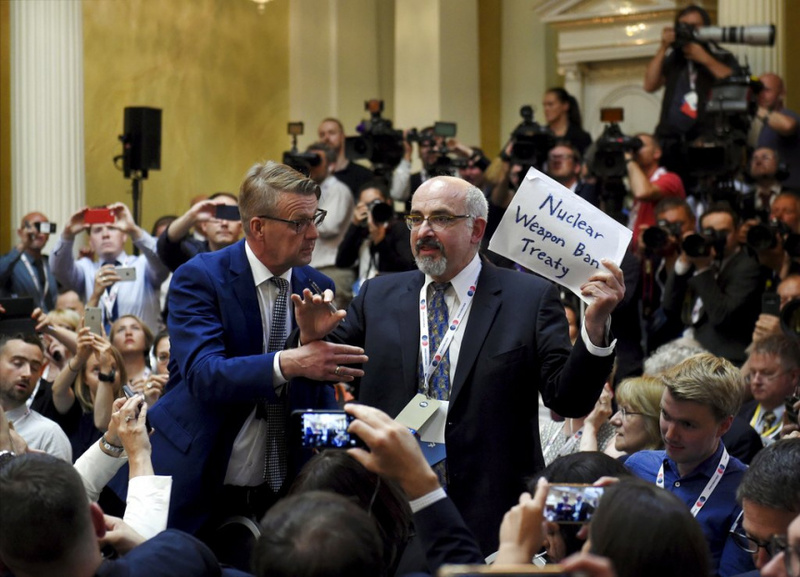 Sam Husseini, a contributor to The Nation magazine, told The Associated Press that he held up a piece of paper with "Nuclear Weapons Ban Treaty" printed on it to get attention so he could ask a question "on Syria's nuclear policy" and the nuclear arsenals of the United States and Russia. "I wasn't doing a protest," Husseini said in an AP interview. "I simply wanted to hold up a sign so that they would call on me.